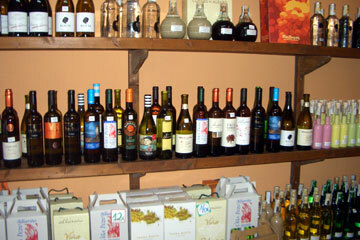 If you are in the UK, Albarino wine has become very popular and very available over the last few years. 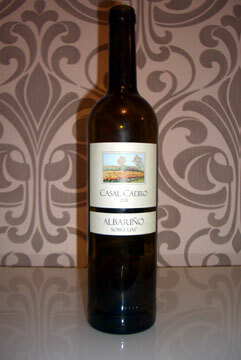 Supermarkets like Waitrose, Tesco, Morrisons, Asda and Aldi now sell Albarino. During the summer of 2014, Aldi actually sold an Albarino that was bottled by Martin Codax (a well known and respected bodega) and, to a non-expert like me, it tasted very acceptable. It was priced at about £6. By August, Aldi seemed to have sold their allocation (i.e. no more on the shelves), but low and behold, Tesco now had their Martin Codax Albarino instead! In the USA and Canada Albarino is also available and I believe that it is (or was) served by British Airways in their first class cabins. As a generalisation, Albarino should be served at between 9 and 12 degrees C. A merchant in Cambados told us that if you do not have a wine thermometer, the easy way to guesstimate this is to put the bottle in the fridge 30 minutes or so before serving. Right or wrong, this is what we do and there is no doubt that over chilling an Albarino has a negative effect on its taste. 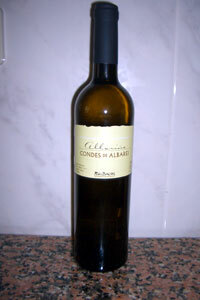 In terms of price, the UK supermarket Albarinos will run from around £6 to £8 or £9. 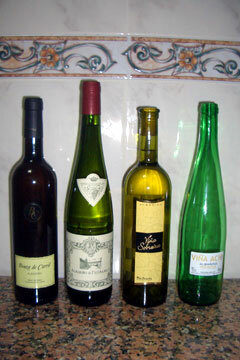 Most of these wines will give you the bodega name along with the denominacion de origin label. This is required to confirm that it really is Albarino from the Rias Baixas. That said, they will be produced specifically for the supermarket in question and as such will not be the bodegas best produce. Still in the UK (but no doubt true in other parts of the world), if you want something more up market, then wine merchants will be the answer. Most merchants will stock at least one Albarino, although all of those that we have spoken to knew very little about the wine, its origin and characteristics. The photo to the left shows some of the Albarinos that we tried during the period of the Albarino fiesta in Cambados at the end of July and the start of August 2014. As I have already mentioned, my expertise in wine runs solely to what I do and do not like - I am no expert, but then again most of us are not. Whilst in Cambados in 2014 we bought six different Albarinos from six different bodegas. The prices ranged from 5 Euros to 11 Euros, with one of the bottles being the wine served at the pazo hotel in Cambados (a pretty good recommendation one would think). All of these wines were good and in fairness the more expensive ones did taste better (like the one served at the pazo). Some of the descriptions that I have read describe Albarino wine as tasting of white fruits like apples and pears and for my part I think that there is a citrus like flavour there as well. I also think that there can be a slight peach flavour too (like the peaches that you get in Spain with the white flesh), but that is just my taste buds talking. Back in the UK, and in 2014 we bought a 2011 Casal Caeiro (Bodegas Castro Martin) from a merchant in Knaresborough, England. This wine, I am informed by a keen wine drinking friend, is the most highly rated of the Albarinos and, having been fortunate enough to have had a tour of the bodega in question, I can understand why. Casal Caeiro is far from cheap, but on tasting it you are immediately aware of the quality and, for my part, I would have to admit that it is one of the best wines that I have tasted. Photo left, is the Casal Caeiro referred to. I believe that there are three different denominations from this bodega. So far I have tasted two of them.